Rectangular homes cannot have the inherent strength that our hybrid geodesic panelized home has. Watching the news about the devastation which Hurricane Sandy brought to the East Coast makes us all realize that everything man creates is insignificant when compared to the power of nature. Having grown up on Long Island, my heart goes out to those tens of thousands affected by this tragedy. The typical suburban house that our family lived in was built in 1955. It had a full basement, part of which was finished into two bedrooms that my brothers and I shared. I remember when the carpenters came to finish out these rooms. I would go down there when they left for the day, and was fascinated by how it all went together. Maybe that’s what sparked my interest in building, and led to my career as a building contractor. The houses now built here in Reno, NV, and most everywhere in the US, are much different than those built on the East Coast in the 1950’s. Those older homes didn’t have the straps, ties and hold downs that are required for homes built today. We all saw pictures of houses lifted off their foundations and moved hundreds of feet, still in one piece. This would be much less likely to happen to a newer house fitted with contemporary framing hardware. Today’s codes do make for stronger structures, but we can do better! I hope that out of this terrible tragedy, new ideas will appear on the horizon that will make our homes even stronger. We can only imagine what will be the shape of things to come. Of special interest to all of us here at Envirohaven was a CNN special report on the devastation wrought by Sandy that mentioned houses which looked undamaged from the street. When inspected further, there was evidence that they had actually twisted, from the strong winds. Where there once were straight flat walls, now an S-curved surface extended the whole length of the house. The reporter said that the whole house would need to be torn down. Even though still attached to its foundation, with no obvious blown out walls or roof, these homes became a big pile of trash. What could have been the cause of this? Almost all houses these days are made of rectangles. A four sided rectangle is a very unstable structure. If you apply pressure to the side of an un-reinforced rectangle, it will deform rapidly. Keep up the pressure and it will eventually flatten. Builders add “shear” to these rectangles to strengthen them, by nailing plywood or OSB to the frame. This is a good solution, but not the best. A severe weather event like Hurricane Sandy, and the tremendous power it brings, can deform even reinforced rectangles. Triangles, on the other hand, are the strongest shape there is. An un-reinforced triangle will not deform when pressure is applied to one side. Reinforce it with plywood sheeting, and you have something that is almost impossible to bend out of shape. Imagine a structure made of interlocking triangles. It will be close to indestructible. After the HUGE 9.2 earthquake in Chile a few years ago, the only structures left standing in Conception, the town nearest the epicenter, were houses made of interlocking triangles. Envirohaven, is currently manufacturing triangular based homes. The principle behind our patent pending design combines the strength of interlocking triangles, with the space efficiency of a hemisphere. The efficient utilization of interior space is superior to what is found in a traditional rectangular home, a traditional “dome” structure or yurt. If you’re interested in learning more about strong, hyper efficient, cost effective and sustainable homes, check out Our Homes. Please remember that that an unimaginable number of people are still homeless, without power, heat (in severe winter conditions), water, clothing, food, and any basic necessity you can think of. The Red Cross is still the go-to organization in times of disasters. There are also many local organizations in New York and New Jersey that are doing the hard work of helping people and animals in every area of need. 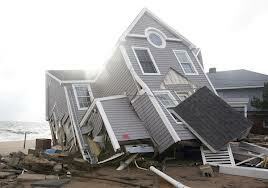 Do you have questions about this post, or, do you have experience with homes that have survived a natural disaster? We would be very interested in hearing from you.